YOUR INTENSIVE CARE HOTLINE - My Uncle in the ICU Had a Stroke. Will He Be Able to Recover After Two Weeks in the Intensive Care Unit? Hi, it’s Patrik Hutzel from INTENSIVECAREHOTLINE.COM where we instantly improve the lives for Families of critically ill Patients in Intensive Care, so that you can make informed decisions, have PEACE OF MIND, real powermailto:https://intensivecarehotline.com/, real control and so that you can influence decision making fast, even if you’re not a doctor or a nurse in Intensive Care! My Uncle In The ICU Is In A Critical Condition. Why Does The ICU Team Opt For Euthanasia? In this week’s episode of “YOUR QUESTIONS ANSWERED“ I want to answer questions from one of my clients George as part of my 1:1 consulting and advocacy service! George’s uncle is in a coma in the ICU and is asking about the best treatment for him to wake up and be in a good condition. Patrik: Therefore, that’s what I mean, a tracheostomy and a feeding tube, they’re basically lifelines, they’re on the one end tracheostomy will give air, oxygen, it’ll give air, oxygen and it could ventilate your uncle as well. And the other thing that the PEG tube is doing its feeding your uncle. So again, without that he can’t live. Your uncle has a feeding tube at the moment as well, I saw it in the video. But it’s not on his tummy, it’s actually in his mouth. Patrik: A tracheostomy and a feeding tube will buy your uncle time. It might also be … have you or your family, have you asked the neurologist about getting into rehab? Have you asked that question? George: Yes, the thing is after this surgery, once he’s stable they can send him to the rehab. Patrik: Okay. Well, if he brought that up already, then again that maximises his chances of any meaningful recovery. George: Well, okay. Here is my concern. All the family members, we have discussed this over and over. We don’t want to make him suffer for one year, two years. He can’t … he cannot do anything, he is unable to do anything after what he has gone through. Maybe he’s going to open his eye and he’s not going to be able to tell us anything, he’s not going to be able to… I… I.. We don’t know that situation, what it’s going to be worse? We don’t want to have him suffer like that. Rather to go for two days or three day and then he die. Again, we know that maybe that’s not the outcome. He may prefer for 10 days, we don’t know. But also, please talk to the neurologists about the MRI, because they are the experts on reading the MRI scans and explaining the reports! George: Okay. Now … I got you. I’m still right now we were all thinking that, “Okay, he’s not going to be … we don’t know he’s going to be capable of anything or not.” We don’t know hoping he’s going to recover 50% or 60% or 10%, we don’t know that. George: According to what has occurred we are thinking that he’s not going to be capable of doing even 10% of these things. So, we thought we make him suffer for one year or two year, whenever he dies, we’d rather have him die like that. I’m sorry to say this word, but my mom and mom’s sister and my uncle, his older brother, they’re all thinking we don’t want to be making suffer. That’s why we were gonna … we almost said, okay we should not do any tubing or anything. Just take him off of everything. And I guess let him rest peacefully. That’s what we are thinking. But according to what you tell me, now my decision is I think we are not doing that like to him. So I don’t know. I’m confused. Patrik: Right and it is a very difficult decision to be made. Have you or your family, have you ever discussed with your uncle what he would want if a situation like this presents itself. George: Yes, this is the same person, this is the same situation doctors and neurologist asked us. What was his idea of living, you know? If something were to be happening, looking at the other people, so he’s right. My aunt told us, well he told her a couple of times, if something happened to me, just let me go. Don’t keep me too long stressed. Patrik: Well, that’s an indication. That’s an indication. It’s a very difficult decision to be made, George, there’s no doubt around that. And there’s also no right or wrong answer, there’s only an answer that’s suitable for your family situation. What you may decide … what you decide is going to be the right decision, there’s no doubt in my mind that whatever you decide is going to be right. It’s just a matter of thinking it through. And acting what you think your uncle would have decided if he could make his own decision. Patrik: It’s very difficult, George, there’s no doubt about that. George: Now, have you gone with any patient like this … they had a similar scenario where their heart has stopped over 15 or 20 minutes. And then they have recovered maybe 50%? Do you know any like that? Again, that’s also a question, what’s acceptable for a patient and for a family? And that could be very different for you than it is for another family. Even though some families tell me, “I’m so grateful the information that you providing is out there. I’m so grateful I kept my husband alive even though he’s in a wheelchair.” Or he might be bed-bound. “But I’m very happy he’s here. He’s very happy to be here.” It depends, there is no one-size-fits-all. It’s really a very individual situation and decision to be made. George: Yes. Let me ask you this, I’m going to have to make another phone call, another visit with you. And this time I’m going to try to gather up some key family members. George: And probably let them ask you questions, you ask of them what you asked of me. George: And let us decide, let us make the best decision that we can make for him for our loved ones. We don’t want to make him suffer but I know that there is a possibility what we are doing. So it’s totally … I don’t know. We’re like really confused. We don’t want to make him suffer, and yet … nothing is in our hands. Patrik: Absolutely and you know George, the other thing that is so important is for you and your family … I’ve worked in intensive care for nearly 20 years. You and your family, you don’t have perspective. The reason I’m saying that is, your uncle has been in ICU since the 31st of May. So today is the 14th of June, so that’s two weeks. It’s nothing. It’s nothing, two weeks is nothing. If your uncle had been in intensive care now for four weeks he would be off sedation completely and they would be able to manage the seizures then I would say, “Yep, now you’ve got enough evidence after four weeks.” But two weeks is nothing. George: Okay. So are you telling me … you think, I think according to you, what you have told me, I think to you, you have a hope that there will be a better outcome, right? Patrik: I definitely think there will be a better outcome, that’s what I think. But the question still then remains, is that better outcome acceptable for your uncle and your family. That is the remaining question. George: Yes, but we don’t know what the outcome is. Patrik: Correct. We don’t know, we don’t know. The seizures as such, I don’t see as a good sign, I don’t see that as a good sign. That is often a sign of significant brain damage. But you still haven’t seen what your uncle is capable of just simply because he’s still on sedation. And what would be good to know is if we do talk again, what sedation he’s on. It would be really helpful to know what he’s getting at the moment for sedation, for pain relief, as well as, what he’s getting for the seizure management? And when we come off this call, I will send you some information around tracheostomy and I will also send you some information around sedation. Because it’s really important that different sedatives or sedation medicine in use in intensive care. And depending on what he’s been getting, it could delay him waking up. HOW TO COPE WHEN YOUR LOVED ONE IS CRTICALLY ILL IN THE ICU. George: According to those MRI that you looked at, what do you think his coming back from the first part of the brain? How good do you think, how much the memories and how do you think he is going to be coming out? What do you think on that? Patrik: When I looked through the report, the reports to me say that there’s more intact brain than there is damaged brain. That’s the way I read the report. That there is more brain intact than there is brain damage. You look at the report and it says on the top, it says comparison … where is it? The remaining brain shows normal anatomy and signal intensity, there is no sign of tumour, infarct, or haemorrhage. So in the beginning it says defusing imaging also reveals a small, a small three millimetre focus of restricted diffusion in the right parietal cortex consistent with acute infarction. So, then it says there are no other areas of restricted diffusion noticed. So it’s talking about a small three millimetre infarct. That’s relatively small, what’s important to know George, the video that you’ve shown me, the video that you sent through. The patient who has been in an induced coma for two weeks. Who has been heavily sedated, wouldn’t look any different coming out of an induced coma. What I’m saying is, a patient with no brain damage, after two weeks in an induced coma, wouldn’t look any different to what your uncle looks like in the video. George: I don’t think so. Patrik: You don’t think so? Why not? George: No, no, what I’m thinking is after two weeks of induced coma a normal person will look same as him. That’s what I’m trying to tell you. Patrik: A normal … a person, let’s just say a person who is in an induced coma for pneumonia for two weeks. And they are on the ventilator and they are inducing the coma and after two weeks you wake them up, they wouldn’t look any different because the medicine they are getting is so heavy, is such … How can I describe it. George: That’s what I’m trying to tell you. That’s what I’m trying to tell you, they would look the same as my uncle. Patrik: Absolutely, that’s exactly what I’m saying. That’s exactly what I’m saying. Patrik: So, because that medicine that patients are getting in an induced coma is very strong, and it’s keeping people asleep for as long as you would like to see people asleep. But it has a lot of side effects. And that’s why when patients come out of an induced coma, they don’t wake up, it’s not like switching on a light with a switch. It’s like switching on a light with a dimmer, slowly. George: Okay, now let me tell you this. We’re going to have to have another consultation because this is getting out my zone now. I think two ways, and I have always been thinking two ways. We always have a hope, okay one day he’s going to wake up. But now what the doctor is telling us, because of the lack of oxygen making the brain damage, because of the brain damage he is not going to be the same person. But we’re asking, okay, we know that he’s not going to be the same person. But if he makes … what if he will be able to come like 50% or just only 20%? We don’t want to see him at 20%. 60% or 50% is acceptable to us maybe, you know? Patrik: Absolutely. And that’s why I’m saying. I do believe two weeks is not long enough to make a decision. That’s my personal and professional opinion that I think is way too early to make a decision. I do believe doing a tracheostomy is probably relatively safe, and you can still stop life eventually if you think life with the tracheostomy, okay, he’s not improving. But it will buy your uncle time. George: After the tracheostomy and tubing, this means that he is not improving at all, we can just take it off. “PULLING THE PLUG” AND DYING IN INTENSIVE CARE WITHOUT FOREWARNING OR DISCUSSIONS? George: Okay. All right. What I’m going to have to do … are you going to be available for … what is the timing over there? Patrik: For me, it’s coming close to 12 pm. So for me it’s early in the day. Very early in the day. George: Another thing, I am right now speaking in my vehicle, but still some of the time I’m having a hard time to understand. Maybe it’s because of the not good voice signal. But I don’t know maybe if we have to do Skype? Patrik: Skype would be great. George: Okay, it would be the same and number right? Patrik: No, Skype … what I would do George, I will send you an email in a moment with some more information. And my Skype details are in my signature. I’ll put my Skype details in there. Skype would be great. George: Okay. Did you tell me about that … remember earlier you told me that if we take him off everything, we might have to give him an injection to help him, right? Patrik: Yes, I have sent you that euthanasia, I have sent you that already, just the term. George: Okay. All right then, I need to pay another 99 right? Patrik: That would be great. I will send you information about tracheostomy. And my Skype details as well. George: Okay. And I would also like to send the email image for the MRI and that report so big, if we can send you on a different attachment and maybe see if you have more chance to study that MRI. Patrik: Yep, please. No problem there at all. But also, please talk to the neurologists about the MRI reports and scans as well, because they are the experts on reading the MRI scans and explaining the reports! George: All then, okay. We will talk to you again today. If not then maybe tomorrow. Patrik: No worries, I can be available. George: Maybe tomorrow will be earlier than this. George: It could be hours earlier. Patrik: Any time, any time. George: Okay, all righty then. I think this was very helpful for me. I never thought about what you have … you have given me a lot of information. Patrik: Good, good. I’m glad I could help. George: Yeah, okay, well thank you. Patrik: Thank you so much, George, and I’ll talk to you soon. Look out for that email. Thank you. Bye-bye. Make sure you also check out our “blog“ section for more tips and strategies or send me an email to [email protected] with your questions! The ICU team is telling me and my mom to stop her medical treatment. Can they end her life without my consent? The ICU team is giving my mom too many sedatives. 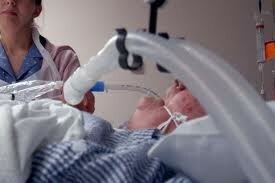 Are they slowly killing her or are they helping her to wean off the ventilator? My Dad in ICU is on a regular CPAP machine. Why does the ICU team tell me that we cannot connect his trache on to the CPAP machine? My Dad was Transferred Back to the ICU Because of Congestion. Why Does the ICU Team Withdraw Him from Treatment? My Uncle in the ICU is in a Critical Condition. Why Does the ICU Team Opt for Euthanasia?